The Brentwood Cake pop maker brings the fun and delicious cake pops trend into your own kitchen. Bake 12 cake pops or doughnut holes in just minutes. Add sticks and a touch of creative decorating for perfect cake pops. The nonstick coating makes baking and clean up fun and easy. The manual includes a variety of tips and recipes that will help you enjoy the baking experience. 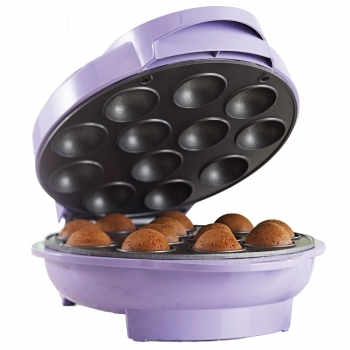 The cake pop maker features power and ready lights, convenient cord wrap, and latching handle. * Makes 12 Cake Pops at once!